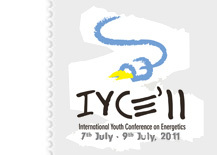 International Youth Conference on Energetics (IYCE) had two successful previous editions in 2007 and 2009 in Budapest, Hungary, organized by the local Student Association of Energy (SAE), providing a good opportunity for young researchers (undergraduate, MSc, PhD students and other young professionals), working in any field of energetics and power engineering, to present their work in an international forum and make contacts for their future. The third edition of this conference will take place in Leiria, Portugal, proving the interest in making this event even more internationally shared and recognized. The event will be organized in cooperation between the R&D unit Institute for Systems Engineering and Computers at Coimbra (INESCC), the Polytechnic Institute of Leiria and the Hungarian Student Association of Energy. The first and main concern of the organization is that the conference may be held in an informal and smooth way, with plenary sessions as well as oral and poster sessions, to offer a wide platform for discussions and experience exchange. The meeting is also aimed to give the opportunity for making new friendships in a very pleasure atmosphere. Therefore, apart from the technical sessions, the social programmes will allow the desired informal contacts and also give a touristic overview of the country, in particular, the western region. The seaside proximity, in the summertime, is an added bonus to this location and will be well exploited. We expect that this event in Leiria in 2011 will be a meeting point for the youth of Europe and the World who are related to energetics.